On February 16, Frank Raes (head of the European Union's research unit on Climate Change and Air Quality) gives an introductory lecture on the theme "How to live with climate change". The lecture starts at 19.30 in STUK Auditorium and will be in English. Admission is free. The exhilarating performance Expanding Energy takes you on an energetic trip through the problems of sustainability. After an introduction in which the audience is given the chance to make an active contribution to a cleaner, more sustainable world, the artists burst into in a mass choreography that captures our addiction to energy and progress in a way that is energizing as well as thought-provoking. 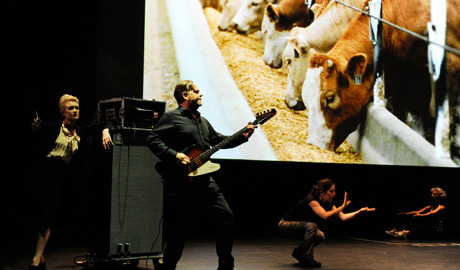 Davis Freeman, Jerry Killick, musicians Paul Lemp and Jochen Arbeit (Einstürzende Neubauten) and twenty dancers create this climate neutral performance. At the start of the century, Davis Freeman and Lilia Mestre created the company Random Scream to expose the eclectic elements of everyday culture in the form of dance, theatre and visual arts. Their projects draw attention to invisible processes by focusing on our personal interactions and how our choices directly affect each other and the community we live in. Davis Freeman / Random Scream is looking for 20 performers to join this performance. The performers would join the crew in the performance that consists of Davis Freeman (Random Scream), Jerry Killick (Forced Entertainment), Paul Lemp (Candy Bomber) and Jochen Arbeit (Einstürzende Neubauten). Together we'll be able to create an energy dynamic, which would never be possible, alone. We are looking for performers of all ages from 14-60 years old who would learn a short phrase including (Tai Chi, stomping, shaking, twisting, Charleston, and a 12 minute run in the end of the piece). We're looking for all body types and nationalities that consider themselves movers in one way or another. We are looking for professional and amateurs who would like to join us for this rare opportunity to combine our energy together for this large-scale creation. Friday the 17th of February from 19h (performance at 20.30h). In the context of Kulturama. Click here for mor information.